The move from Seattle to a small town of Franklin, Texas is suspect to Baker, who was well settled in and quite comfortable, thank-you-very- much, with a best friend and a baseball team and a tony job as Grandma's apprentice puppeteer. With the help of a ventriloquist's dummy given as a going-away gift, Baker works on building his confidence and talents he will have to offer his new community, hopefully in time for the big Franklin Fall Festival, in which a long-lasting rivalry between two small towns peak in the form of performance. The description of the fair, replete with Frito Pie fried Oreos and Tilt-A-Whirl, is rich with regional warmth and detail. Clearly, the Lone Star state is far from the lonely star state, as every child gets a chance to shine and a small town proves just as good as a big city for making friends. This past year, I had the very good fortune of learning how to give a kamishibai show under the guidance of master early childhood educator Carolyn Tripp. She let me use her authentic theater for library storytimes; it took me a long time to find out where to get one just like hers, but you can write a grant and find one here! It's a lot of fun; the story is written on the back of the a series of pictures on stiff paper, and as you read the story as the children view the image inside the frame, offering the lure of television without the electricity. The last picture has the first text to be read, so as you change the picture by moving the first picture behind the others, the text changes in progression. 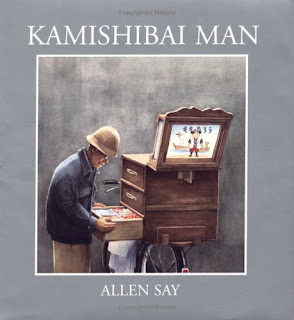 The traditional kamishibai story cards are exciting, but they are expensive; I found it worked even better to make our own kamishibai-style stories by drawing on paper that fit the screen, and typing out the text and attaching it to the back for reading. "Goldilocks and the Three Bears" kamishibai-style! I drew some of the pictures, and the four-year-olds drew the rest. Play some jaunty background music as you read, and you're off! 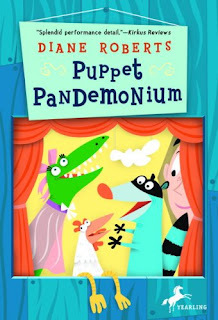 And at the risk of feeding consumer frenzy, on the subject of storytelling theaters, I do have to let you know about one of the most beautiful and extraordinary things I came to own in the past year, A Grand Little Theater of Puppets, in the hopes you can have one, too. When a teacher friend and I took it out of the box, we both practically had to reach for our inhalers, it so took our breath away! We couldn't stop sighing and shouting! What an heirloom! Inspired by popular European toy theaters from the 19th century and the vision of educator and puppeteer Judith O'Hare, these sizeable tabletop theaters have an elegance and attention to detail that is from another time altogether. The theater came with five gorgeous little rod marionettes from Hansel and Gretel, and a book of pop-up scenery that the puppets play on. 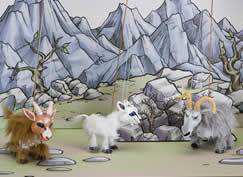 I loved the first set of puppets, but the Three Billy Goats Gruff story set was even better (so much fun to make the little guys trip-trop!) and there is a shadow puppet accessory pack for a whole different effect. 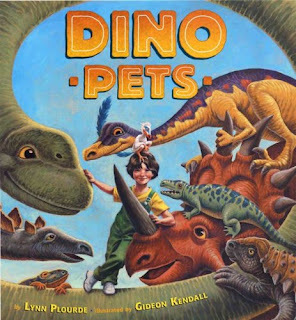 This is a well-crafted treasure for any child with gentle hands, or a great way to say an extravagant thank you to a favorite teacher or librarian. 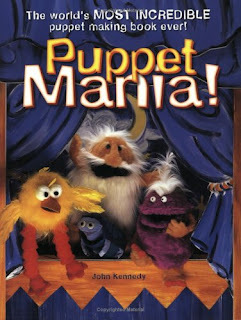 Lastly, let's wave goodbye with puppets on our hands, with the help of YouTube and puppets by Folkmanis: check out The WitchyPoo Story Hour (which is really only about two minutes), and you can join Volfy and me as we lip-sync to Howard Keel and Kathryn Grayson singing "Wunderbar" from KISS ME KATE, goofing around at the PlanetEsme Bookroom. (Clearly, I'm no Jim Henson...thanks for loading anyway, JesusMom39). 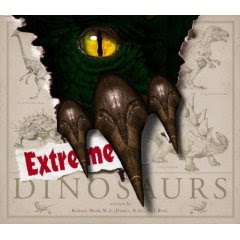 Well, there certainly seems to be a propensity to put eyeballs on the covers of dinosaur books; thank you, Steven Spielberg's scary Tyrannosaurus peeking-in-the-car scene from Jurassic Park, I guess! That said, you'd do well to eyeball these recent additions to the shelves on this ferociously popular topic. Uh-oh! The owls got jealous of the penguins featured in the last post, so to make up for the courtesy that poor Kucinich never received in the debates, I'm giving them equal time. "If you want to grow up to be a wise owl, you must stay up late," said Papa Owl. 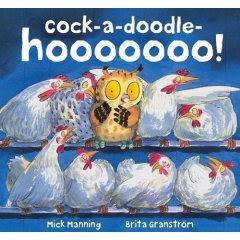 "And besides, I don't give a hoot what time your friends go to bed. In this family, we stay up late. Rules of the roost." 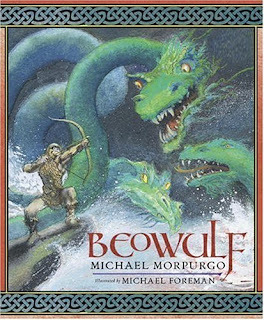 Thanks to my former fifth grade teacher, Mrs. Schultz, for insisting in 1978 that I read Farley Mowat's classic OWLS IN THE FAMILY (Dell, 8 and up), despite my wheedling and fervent complaints that 1) "I don't like animal stories," 2) "this book has too many boys in it," and 3) I couldn't read words like "Saskatchewan." 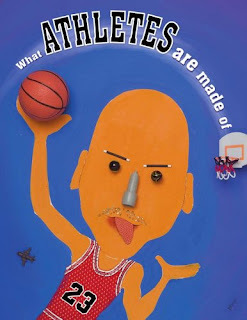 I know the trend nowadays is to present children with books that have characters and situations to which they can closely relate. While that is inarguably important, I consider myself very lucky to have had teachers who also encouraged me to read to meet others so very different than myself (even boys! ), and to use reading to expand my world, not just to affirm it. Today, dear booklovers, in your effort to be a supporting character in a child's reading life story, recommend a book outside of the box, and send out a thank you to a teacher who did it for you! 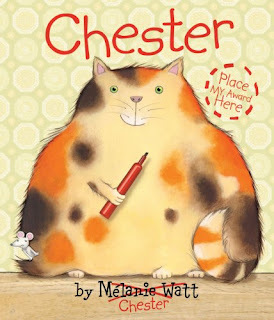 A huge thank you to young adult literature guru, author and blogger extraordinaire Cynthia Leitich Smith for awarding (or is it a-roar-ding?) 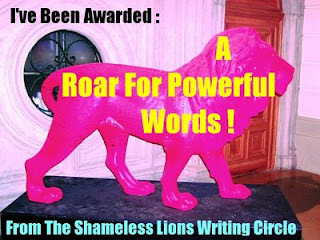 The PlanetEsme Plan a "Lion Award" from the Shameless Lions Writing Club . The award is in honor of "those people who have blogs we love, can't live without, where we think the writing is good and powerful." Award recipients then give the award to five other bloggers. In fact, the best part of the award is that it did come from Cynthia Leitich Smith, who would have been first on my list to nominate. 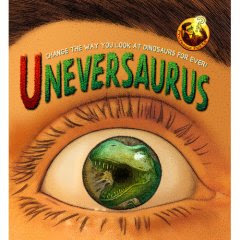 Her own website, Cynsations, is a gold mine of information, interviews and inspiration for anyone involved in the field of children's literature, and in fact, it is she who inspired me early on to recognize the internet as a potent way of getting the word out about the power of children's books. 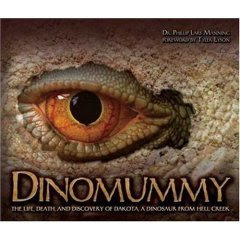 Though she is a professional cyber-mentor, privately, I enjoy her personal blog SpookyCyn; although she has lots of juicy insider writing stuff there and updates on her gothic fantasy TANTALIZE , I must confess I mostly bookmarked it because I savor her gem-like descriptions of meals she eats around Texas! 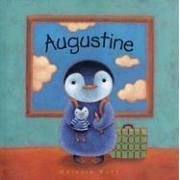 Even a children's book maven like me needs variety on the menu, and Cyn's posts always hit the spot. 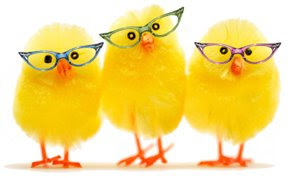 THREE SILLY CHICKS Created by children's authors Andrea Beaty, Carolyn Crimi and Julia Durango, this blog never lets us forget that kids wil keep reading if they are laughing. Regularly updated, it also features offbeat interviews and contests. VINTAGE BOOKS THAT KIDS LOVE I believe the average children's book goes out of print in about two years. 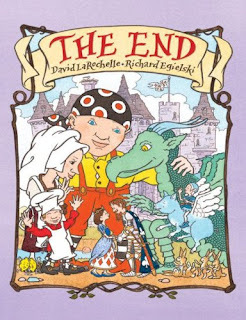 This lovely site, replete with sample illustrations, keeps books in our hearts for much longer than that. MIMI SMARTYPANTS Not for kids. Oh no no no no no. 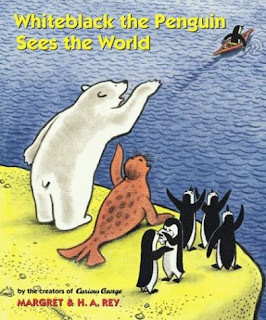 But sometimes I want to read about being a grown-up, even if it's in a world that could clearly be better run by kids. Snarky voice, but voice with a capital "V." Plus lots about Chicago. Bless you and your bad, bad mouth, Mimi Smartypants. Baby, it's COLD outside! Chicago is only fit for penguins this time of year, so button up your overcoat, here we go! P.S. Please excuse the following blogger-to-author billet doux. Dear Polly Dunbar. I love you and everything you do! 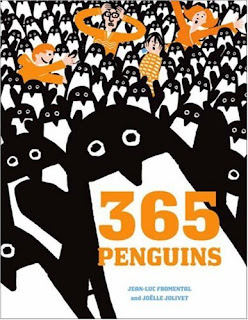 You draw the cutest children in the world, and your penguins aren't bad, either. Please come over, we can make dolls together and I will serve you cookies. XOXOXO from your fan, Esme. P.S. Your home page is adorable, too. Some oldies but goodies (things stay fresh in the deep-freeze, you know)! 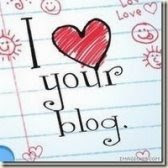 I want to thank everyone for the warm welcome back to the blogosphere! I very much appreciated all of your kind notes, and I am so gratified that the recommendations you find here might be helping to get these great books into the hands of great kids (and book lovers of all ages). 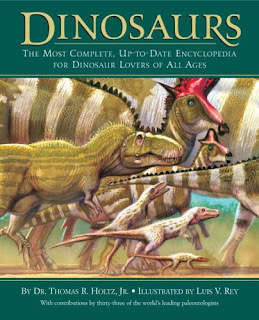 I have received several queries if I will be posting a list of the PlanetEsme best books of 2007 here, and the answer is yes, as soon as I am done reviewing them! I will continue to review the brand new stuff, but since I still have a big leaning tower of 2007 reading power to share with you, I'd rather not rush. The complete list will be posted by early March, before the next publishing season is fully under way. In fact, if I may put on my author hat for a moment, this makes me happy, since after the big ALA awards are announced in January, publicity for books published the prior year can get a bit sleepy. In children's books, there should be no "flavor of the month." A truly good book stays delicious! So please keep checking in, as all books posted here will be included in that round-up. "There's more than one way to be pretty," said Nana. "I suppose it depends what she does," said Aimee. "I don't know," said Grace. "What does a princess do, Nana?" "You tell me, darling," said Nana. But nobody could, except for wearing beautiful clothes and looking pretty. "That doesn't sound so interesting," said Grace. She liked having things to do. Yes, the liberated young lady who nailed the lead role of Peter Pan in AMAZING GRACE is back, this time inspiring her class to rethink what makes someone really royal. When the school gears up to make a float for the parade at the annual community festival, the girls start vying for who gets to wear the crown. Uninspired by the standard fairy tale fare, Grace again rises to the occasion with the helps of books and her lively imagination. 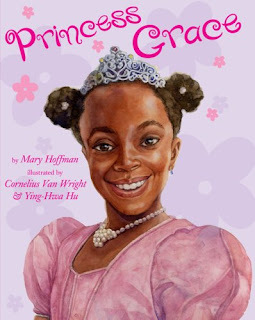 Taking advantage of the opportunity, Grace's worthy teacher shares more stories of real princesses, some warriors like Amina of Nigeria and Pin-Yang of China, and other brave and brilliant princesses who didn't just sit on their thrones; they were artists and scientists and athletes and spies! If there were so many different kinds of men and women who wore crowns, might there be a little more room of the float? 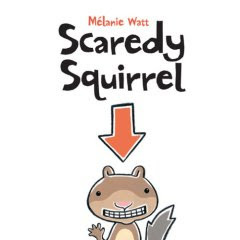 This story gains momentum with every page, and is marvelously true-to-life in representing a classroom that is inclusive, energetic, diverse and full of ideas that are always evolving. 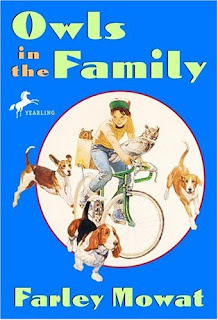 The author is refreshingly modern in her depiction of realistic situations and feelings such as Grace's loving single-parent home, and boys who want to get in on the dress-up action. Realistic watercolors capture the dreamy faces of the girls in the midst of their pretend. 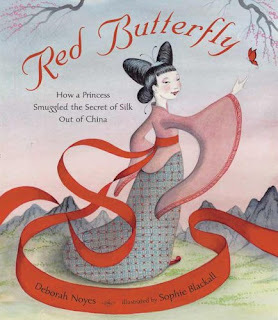 Grace's stories are always joyful, but this latest is a special treat because it has so many classroom applications: a great springboard for Cinderella stories from around the world, or research into real royalty through history. 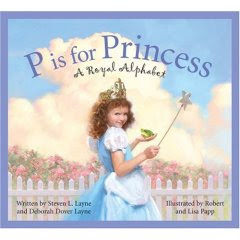 A succinct note from the author at the end of the book helps us on that path, but you will be glad to have P IS FOR PRINCESS: A ROYAL ALPHABET by Stephen and Deborah Layne, illustrated by Robert and Lisa Papp (Sleeping Bear, 7 and up) close at hand when you finish, as it is an attractive and fabulously informative A to Z resource for learning about princesses in both fact and fiction, and also contains a fun quiz at the end. By royal decree, these are two titles that give 80's feminist backlash some 21st century whiplash. 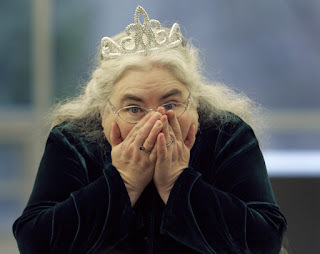 In honor of the new children's book royalty, Newbery award-winning Laura Amy Schlitz (pictured above, being very surprised about her prize, thanks, Educating Alice! ), how about a little princesspalooza? 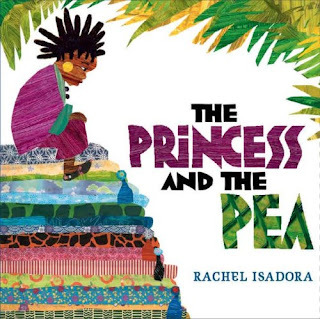 THE PRINCESS AND THE PEA by Rachel Isadora (Putnam) All of the original language of Hans Christian Anderson's classic fairy tale is preserved, but dressed in the vibrant patterns of Africa. 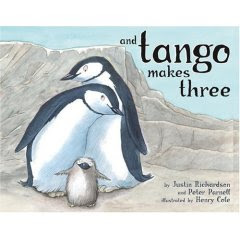 With three ways to say "hello" on the continent at the end, this is a stunningly beautiful addition to any multicultural collection, as well as a great storytime read-aloud. Oh, that pile of mattresses, each one so different and so colorful! Eyes and smiles grow wide with this one. 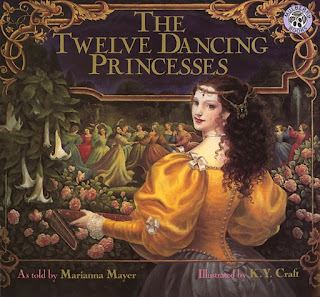 (4 and up) Also see Isadora's recent rendering of THE TWELVE DANCING PRINCESSES, though my favorite versions of that one will always be the heady, classical one by Marianna Mayer and Kinuko Y. Craft and the one illustrated by Jane Ray, in which several of the princesses wear glasses. 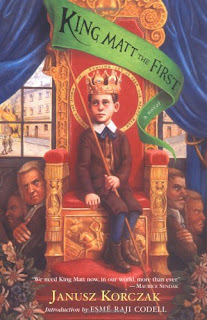 Read them all and compare with your own royal court of children! 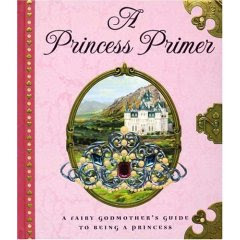 A PRINCESS PRIMER: A FAIRY GODMOTHER'S GUIDE TO BEING A PRINCESS by Stephanie True Peters (Dutton) The "Princesses of Many Lands" page aside, I'd be lying if I didn't say that this book wasn't a little heavy-handed when it comes to the blonde, blue-eyed princess stereotype. 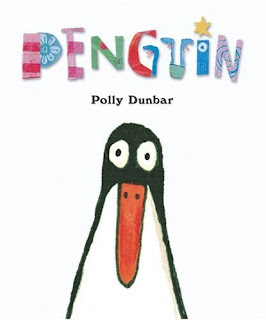 I'd also be lying if I didn't say I would have been absolutely ga-ga over this book as a little girl, and that I have watched people who are little girls poring over its pink pages with unbridled delight. Princess hairstyles! Gown styles! How-to's! Types of enchantment (the lenticular image of a frog being turned into a prince and back again is hilarious)! A glittering, gala guide, the contents takes an authoritative, mannered and almost magazine-y tone that will lend anyone claiming Divine Right an air of confidence and enough know-how to run the kingdom. You decide if you can tolerate that in your favorite princess. (7 and up). Which princess book on your shelf would you take to the ball? 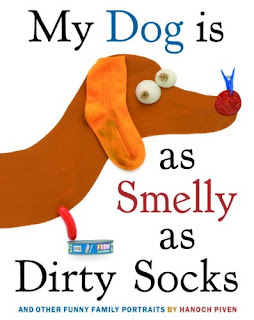 THE NEWBERY AND CALDECOTT AWARDS ARE ANNOUNCED! 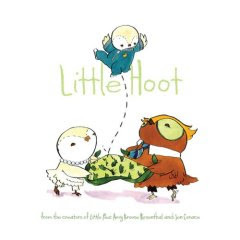 The big awards given by the American Library Association were announced today! And whaddaya know, if you have been following the PlanetEsme Plan, you'll find you have been on the cutting edge for the gold medal winners all along. For more information on the Caldecott, visit here! For more information on the Newbery,visit here! You may also be interested in the Geisel Awards for emergent (early) readers, and the Sibert Award for informational books. And when it comes to prizes, there is still other game in town: booklovers should definitely check out the Cybils, the children's and young adult bloggers' literary award, which I adore because of the shortlists representing a gamut of outstanding choices for readers of a variety of interests and abilities, selected by some very thoughtful and proficient reviewers. 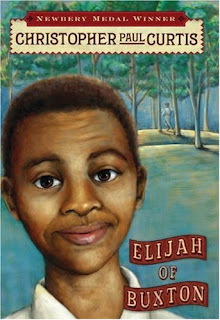 The author and writing coach Esther Heshenhorn (who was rooting for another winner, Christopher Paul Curtis's ELIJAH OF BUXTON recently posted on our SCBWI listserv, "I love this time in January - just before the Newbery/ALA announcements. I go to sleep the Sunday night before the announcement smiling, knowing some writer's life is about to be changed forever. Lives, really, when you think of the readers too." I greatly appreciated Esther's enthusiasm for the awards and their meaning in the lives of the winners, since for a long time I have considered them the Oscar's of children's and I'd be lying if I didn't admit to having made a wishful acceptance speech in front of the mirror in my time. But this year, having stepped back from publishing a little bit and not having anything at stake, I find myself thinking of a little girl named Corrina I knew when I taught fifth grade, who was very overt in her hatred of contests. Having a competitive spirit, I couldn’t really understand it, and so I hosted occasional little competitions with prizes which got the rest of the class’s adrenalin going but seemed to almost drive Corrina out of her mind; whenever I announced winners, she pulled a face that I will never forget! I figured this bad case of “sour grapes” was nothing that a taste of victory couldn’t cure, so I created a situation in which she was sure to succeed. When she won, she ran into the coat room and started to cry. Now it was my turn to go out of my mind, and I started to talk to her about the importance of celebrating achievement, but she just looked at me, exasperated, and asked, “don’t you see the faces of the kids who don’t win? What’s the point of winning over people who are already trying their best?” I have spent years trying to rationalize an answer to that question, but I have to be honest and say I guess I’m still not sure. I do still gush over people's achievements, and cry when figure skaters land their perfect-double-triple whatevers and when performers take a curtain call, but as our culture seems to have more and more opportunities for winners and losers and a tendency, at least on television, for “eliminations,” my enthusiasm is tempered by Corrina's query. Luckily, Corrina recently became a certified grade school teacher so she can pass on her wisdom and perspective. The point is, the big awards represent the excellence of children's literature at large, and more than a popularity contest, the announcements are an occasion to remind us of the excellent body of work that exists and the efforts we should make in the year ahead to connect great kids with great books, whether these books have won a prize in professional organizations or are destined win a place in the heart of a single, special reader. Congratulations to everyone whose books I have reviewed, and to everyone who published a book this year. You dreamed it, and you did it. You win!!! Nowadays, with YouTube and My Space and television and media and thousands of books published every year, Andy Warhol's expectation of everyone getting "fifteen minutes of fame" has far surpassed itself. But what about people before Gutenberg, before the advent of television and computers? How is life documented, how is life remembered, how are lives celebrated? Where go the stories of the everyman? 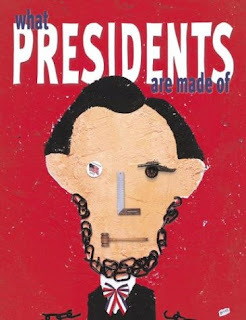 Perhaps all that's left of centuries ago has dissipated into the ethers and imaginations of the new generation, and certainly into the imagination of author Laura Amy Schlitz. 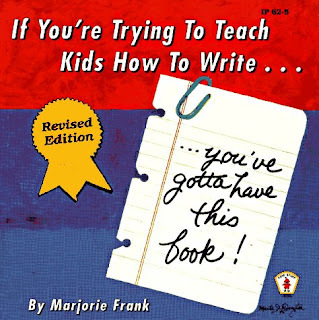 Schlitz, a gifted teacher as well as an author, wrote the pieces in this book for a group of her students. "They were studying the Middle Ages and were going at it hammer and tongs. I wanted them to have something to perform, but no one wanted a small part. So I decided to write monologues instead of one long play, so that for three minutes at least, every child could be a star." In short poems and soliloquies, we meet the members of a Medieval village. Right out of the gate we are speeding along on a dangerous boar's hunt with the Lord's nephew Hugo. We share in the romantic exchanges of the self-conscious blacksmith's daughter Taggot, and hear the fretting over an arranged marriage done in two voices by the glass blower's daughters. We meet outspoken Nelly the sniggler (eel-catcher), who was too willful to drown in a bucket of water as a baby. We hear the laments of Lowdy, the Varlet's child, about the infestation of fleas. Edgar, the falconer's son, faces dastardly punishment for freeing a bird, while young Thomas, the doctor's son, learns the tricks of his imperfect trade. We feel pangs of Jack the Half-Wit, as he endures the slings and arrows of callous neighbors. My favorite of all is the poem of Otho, the Miller's son,"Oh, God makes the water, and the water makes the river,/ And the the wheel goes on forever. Every man's a cheater, and so every man is fed,/For we feed upon each other,/when we seek our daily bread." 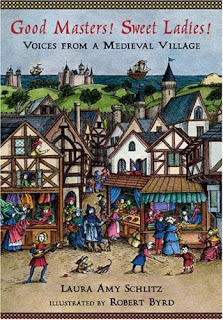 The author perfectly captures the rough edges of Medieval times, the dour struggle for survival, but most of all the beating hearts of the characters, channeled from across the span of time, with desires and delights and disappointments that, like the miller's son suggests, go on forever. The Middle Ages: why read it when you can live it? 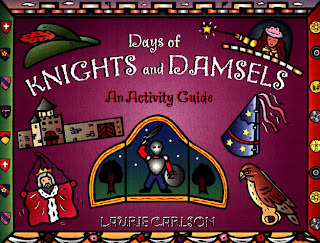 Try the attractive activity guide DAYS OF KNIGHTS AND DAMSELS by Laurie Carlson (Chicago review Press) and KNIGHTS AND CASTLES: 50 HANDS-ON ACTIVITIES TO EXPERIENCE THE MIDDLE AGES by Avery Hart, illustrated by Michael Kline (Kaleidoscope Kids). 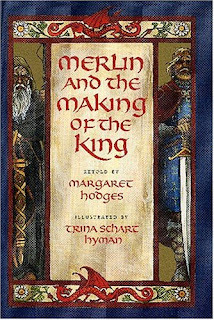 CATHERINE, CALLED BIRDY by Karen Cushman (HarperTrophy) Yes, a novel, but I can't resist reminding you to read Cushman's work for a unique and worthwhile Medieval female's point of view! 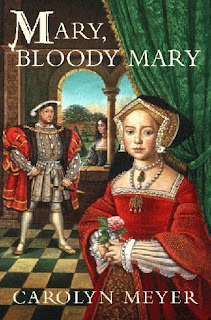 Another good author along these lines is Carolyn Meyer; older children can check out MARY, BLOODY MARY, full of more intrigue than a middle school! 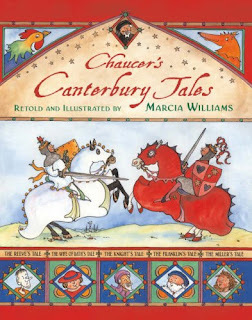 CHAUCER'S CANTERBURY TALES by Marcia Williams (Walker) All the earthy humor and goodwill of the merry classic is captured in colorful comic strip form. Where oh where was this when I was in high school? Check out all of Marcia William's colorful takes on classics, from The Iliad to Shakespeare to Dickens. Fare thee well, gentle readers!